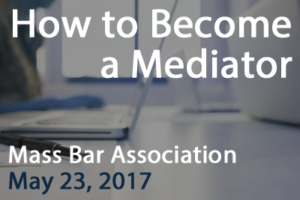 Have you ever wondered how you could begin to include mediation into your law practice? Come and learn from mediation trainers and attorney/mediators who can provide you with information on how to get trained, how to integrate mediation into your practice and how to effectively market mediation as part of your practice. Whether you are a seasoned litigator or someone who is fresh out of law school, this program has something for you. The presenters will provide attendees with resources and information about mediation and why you should think about including it in your practice. The program will conclude with a Q&A session.